When someone says Australia, is the first thing you think of a boomerang? Or perhaps it’s Paul Hogan saying “That’s a knife.” If you’re like me, you think of wine! There is great wine coming from Down Under, and most of it is very affordable and approachable. 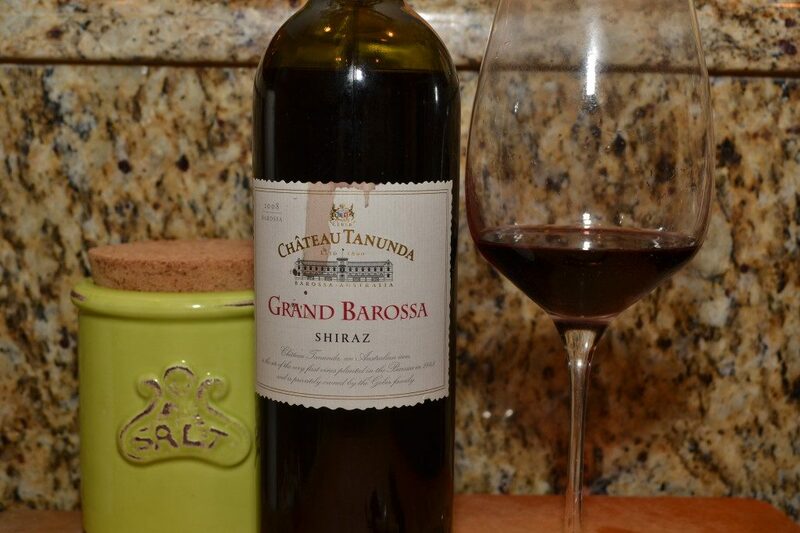 From the Jip Jip Rocks Shiraz I looked at last week, to today’s look at the 2008 Chateau Tanunda “Grand Barossa” Shiraz, Austrailia offers some great wines, and under $20! I believe I received this bottle of Chateau Tanunda 2008 Shiraz as a media sample back in 2011. I recall a blogger event where we tasted and tweeted about three wines, and they rocked. However, I saw this at the back and bottom of my wine cellar last week, so maybe I bought it after the event. Either way, this was a good bottle of wine for $15, even if it’s two vintages old! Aged in mature French oak for 18 months, the Chateau Tanunda 2008 Grand Barossa Shiraz has a dark garnet/red color, and a medium viscosity in the glass. The aroma is vanilla, blueberries and sweet cinnamon. The palate is full bodied, with medium to low acidity, but is not flabby. Even with two years age, there is big, bold bursting red and black berry fruit. Though the wine can sit in the cellar for at least two years, perhaps up to five, it’s drinkable and approachable right now. It’s a simple, easy drinking wine, and for $15-18, it makes a perfect burger wine! This vintage of the Chateau Tanunda Shiraz was rated 92 points by Wine Spectator and #33 in Top 100 Wines of 2011. Though I’ve never visited, a friend of mine here in Florida tells me the property is the most beautiful vineyard in Australia. She’s a transplanted Aussie, so I take her word for it. Chateau Tanunda is Australia’s oldest Chateau, and the site of the very first vines planted in the Barossa in 1845. The Chateau and vineyards are privately held by the Geber family. Are you a fan of Australian Shiraz? Tell me about your favorite by leaving a comment below!